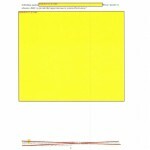 A heavily redacted copy of the Transportation Secuirty Administration’s Behavior Analysis Capability (BAC) Risk Based Allocation Methodology Report from July 2012 that was released under the Freedom of Information Act. 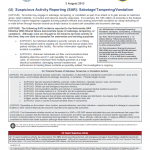 This issuance updates the Functional Standard for ISE-SARs and is one of a series of Common Terrorism Information Sharing Standards (CTISS) issued by the Program Manager for the Information Sharing Environment (PM-ISE). 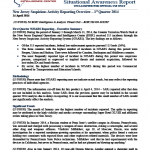 While limited to describing the ISE-SAR process and associated information exchanges, information from this process may support other ISE processes, to include alerts, warnings, and notifications; situational awareness reporting; and terrorist watchlisting. The vision of the 2014–2017 National Strategy is to connect the geographic and public safety diversity of over 38,000 states, counties, cities, and towns together in a way that creates a national information sharing asset that is coordinated with and contributes to federal information sharing efforts. 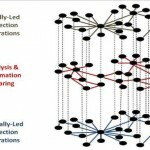 Federal efforts to connect the knowledge and capabilities of the Intelligence Community (IC) often involve state and local law enforcement joining federal efforts. The NNFC is the reversal and broadening of this framework, inviting federal partners to join state and local public safety information sharing efforts. In carrying out this strategy, IC professionals have an opportunity and avenue to bring their knowledge and capabilities to state and major urban area fusion centers, designated by governors and staffed by state and local professionals. As a unique national asset, this state and local network must work seamlessly with field-based intelligence and information sharing entities, providing geographic and interdisciplinary knowledge and perspective without interrupting or replicating federal efforts. 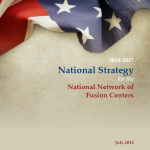 The 2014–2017 National Strategy integrates with other criminal intelligence sharing efforts supported by the Criminal Intelligence Coordinating Council. Supervisors and coworkers are willing to report on behaviors that have a clear connection to security, such as transmitting classified documents to unauthorized personnel, but they are unwilling to report on colleagues’ personal problems, such as alcohol abuse. Because it was difficult to discern which reporting requirements were clearly related to security, there was very little reporting. 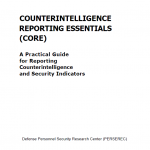 PERSEREC, in collaboration with counterintelligence professionals, developed a clear, succinct list of “Coworker Reporting Essentials” (CORE) behaviors that could pose a possible threat to national security and thus should be reported if observed. The draft CORE was reviewed and edited by counterintelligence professionals at the Counterintelligence Field Activity (CIFA), and was coordinated by the DoD Investigative Working Group (IWG). In December 2012 the President signed the National Strategy for Information Sharing and Safeguarding (Strategy) which is anchored on the 2010 National Security Strategy and builds upon the 2007 National Strategy for Information Sharing. 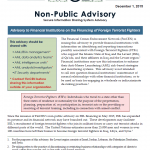 The Strategy provides guidance for more effective integration and implementation of policies, processes, standards, and technologies to promote secure and responsible national security information sharing. 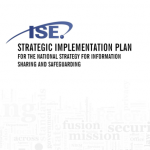 This document provides a higher-level overview of a longer, more detailed implementation plan for the Strategy, and is intended to assist in briefing senior policy makers on plans, progress, and performance related to achieving the vision of the NSISS. 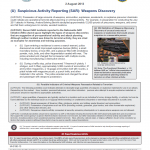 A joint bulletin issued in early August by the Department of Homeland Security and FBI warns state and local law enforcement agencies to look out for people in possession of “large amounts” of weapons and ammunition, describing the discovery of “unusual amounts” of weapons as a potential indicator of criminal or terrorist activity. 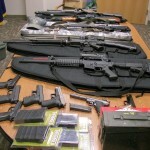 Possession of large amounts of weapons, ammunition, explosives, accelerants, or explosive precursor chemicals could indicate pre-operational terrorist attack planning or criminal activity. For example, in preparation for conducting the July 2011 attacks in Norway, Anders Behring Breivik stockpiled approximately 12,000 pounds of precursors, weapons, and armor and hid them underground in remote, wooded locations. Terrorists may engage in sabotage, tampering, or vandalism as part of an attack or to gain access to restricted areas, steal materials, or provoke and observe security responses. For example, the 1Oth edition of al-Qa’ida in the Arabian Peninsula’s Inspire magazine suggests torching parked vehicles and causing automobile accidents by using lubricating oil or nails driven through wooden boards as simple tactics to cause both casualties and economic damage. 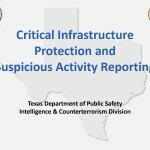 An August 2013 presentation from the Texas Department of Public Safety Intelligence & Counterterrorism Division focusing on suspicious activity reporting in relation to critical infrastructure, particularly dams. The presentation is noteworthy for its reference to the use of TrapWire, a private surveillance product designed to correlate suspicious activity across a variety of domains to detect per-operational indicators of terrorist activity. Expressed or implied threats by an individual or a group communicating intent to commit acts of terrorism or violence or advocating violence against a person, population, or to damage or destroy a facility can be an indicator of pre-operational attack planning. 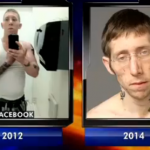 For example, in 2010 a Virginia-based US person pled guilty to communicating threats after he posted a video to the Internet encouraging violent extremists to attack the creators of a television show, including highlighting their residence and urging online readers to “pay them a visit.” He also admitted to soliciting others to desensitize law enforcement by placing suspicious looking but innocent packages in public places, which could then be followed up by real explosives. Stolen, cloned, or repurposed commercial or official vehicles—such as police cars, ambulances, and public utility service trucks—have been used in terrorist attacks. These vehicles could facilitate terrorist access to restricted and hardened targets as well as to emergency scenes. The use of these vehicles can provide individuals the ability to approach targets to conduct pre-operational surveillance or carry out primary attacks or secondary attacks against first responders. 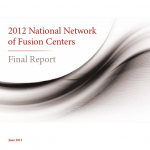 The Department of Justice (DOJ) has largely implemented the Nationwide Suspicious Activity Reporting Initiative among fusion centers—entities that serve as the focal point within a state for sharing and analyzing suspicious activity reports and other threat information. The state and local law enforcement officials GAO interviewed generally said the initiative’s processes worked well, but that they could benefit from additional feedback from the Federal Bureau of Investigation (FBI) on how the reports they submit are used. The FBI has a feedback mechanism, but not all stakeholders were aware of it. Implementing formalized feedback mechanisms as part of the initiative could help stakeholders conduct accurate analyses of terrorism-related information, among other things. 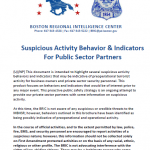 A document issued last month by the Department of Homeland Security identifies priorities for the collection of suspicious activity reports from local communities around the U.S. 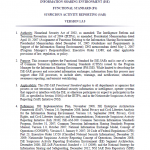 The document describes”topics of interest” identified by DHS Intelligence and Analysis (DHS/I&A) analysts as priorities for the Winter 2013 period that should be utilized by “law enforcement, first responders, and other homeland security professionals” to improve their reporting of suspicious activity. DHS/I&A is interested in the following SAR topics, which have been updated based on current issues of national interest. 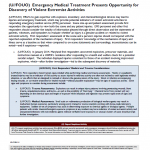 Previous topics remain relevant, and law enforcement, first responders, and other homeland security professionals should continue to submit reports on these issues. Per the SAR Functional Standard, only information validated as reasonably indicative of preoperational planning related to terrorism should be reported as a SAR. I&A is reviewing SAR reports on these topics but would welcome any additional context, ideas or local analysis on these topics and opportunities for joint production.